The Oodua People's Congress has warned the federal government that the operation python dance could send signals of civil war in the country. Oodua People's Congress, OPC, has condemned the militarization of some part of the South-East under Operation Python Dance which kicked off today. 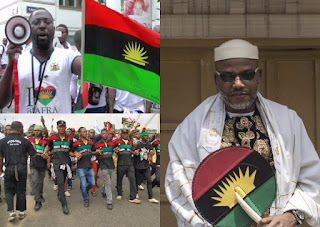 The group said the intention of the government is to arrest the growing influence of the Nnamdi Kanu who is the leader of the Indigenous People of Biafra (IPOB). In a statement issued by the OPC on Thursday, and signed by its Publicity Secretary, Yinka Oguntimehin, the group said the agitation of IPOB could be fruitfully addressed through dialogue rather than the military option being adopted by the Federal government. According to OPC, there was any security threat in Umuahia and its environs to warrant the deployment of soldiers to intimidate and molest innocent Nigerians who are going about their lawful business. The Yoruba group advised the Federal Government to be careful in handling the IPOB issue, adding that any agitation that has been able to attract international sympathy and support like that of IPOB should be handled with utmost care and high degree of diplomacy. Explaing the implication of Military presence in the East, the group said it naturally sends signal of civil war in the country to the international Community, and this will discourage investors, especially now that the country is assumed to have survived recession. The OPC said history does not favour military suppression of agitating groups, citing the case of Odi where MEND surfaced strongly and serious damage done to the nation’s economy even after the President Olusegun Obasanjo led Federal Government was supposed to have successfully muscled the South South community to silence. It said oil supply was forced down to 750 barrel per day from its usual 2.5m barrel as a result of MEND activities, adding that profitable oil activities only picked up in the Niger Delta after the Late President Yar’dua led government successfully dialogued with MEND. The OPC said the nation’s democracy is daily being threatened by sundry issues, chief among them injustice, security and the economy, which it said could naturally be resolved without bloodletting if the Federal Government could be sincere enough to take the best possible option of restructuring the country. Re-iterating its call for the restructuring of the country along regional line, the OPC advised government “to take conscious effort to ensure that the incessant bloodletting in the country is arrested instead of aiding it through unnecessary militarization of the country like is being done in the South East”. The statement added that the recent happenings in Abia between soldiers and members of the public had underscored the urgency to reconsider the necessity of Operation Python Dance 2.